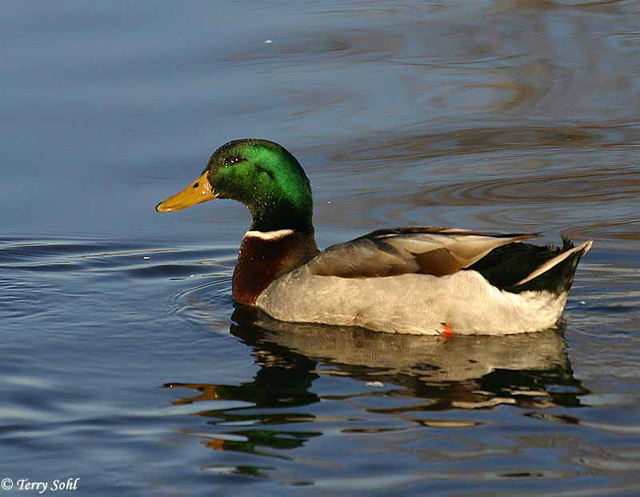 Mallards are probably the most familiar duck to most, and well-adapted to living around human activity. Many semi-domesticated Mallards have learned to live on handouts around city parks and ponds. The Mallard is the ancestor of many domestic ducks. A male is shown in the photo to the right. Additional photos (including females) can be found at the bottom of the page. Habitat: Marshes, woody swamps, lakes, ponds, rivers, city parks. Occurs on nearly any kind of freshwater habitat. Diet: Primarily plant material, such as grasses, pond weeds, grasses, sedges, seeds, grain, and roots. Also will eat insects, small fish, earthworms, frogs, tadpoles, and snails. Behavior: Primarily forages by dabbling on the water's surface...upending and submerging its head and neck. They will rarely dive for food. They also will forage by walking on land. Nesting: Mid-April through August. The bowl-shaped nest of a Mallard is constructed of vegetative material, lined with the bird's own down. The female usually lays between 6 and 10 eggs, and she does the incubation. When the eggs hatch, the young leave the nest within a day and feed themselves, but the female protects them. The young first take flight after about 8 weeks. 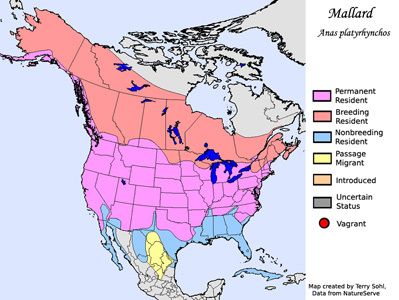 Migration: Spring migration in March, will remain in the fall and winter as long as open water and food are available. Bird Feeders: Will feed on corn or grain scattered on the ground. Similar Species: American Black Duck, Mottled Duck. Females are very similar to many female ducks. Conservation Status: Very common and widespread, adapted well to a human presence. The IUCN lists the Mallard as a species of "Least Concern". Additional Photos: Click on the image chips or text links below for additional, higher-resolution Mallard photos. South Dakota Status: Common migrant and summer resident statewide. Locally common in winter, typically where open water is available.